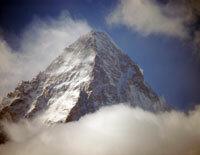 Sad news just now from K2 that Mr. Kojiro Watanabe, 41, died on K2. He had summited along with his four Japanese teammates. It appears he fell during the descent in the Bottleneck, a well-known challenging area. He fell around 8,300-meters about 6:00 pm local time. They had summited between noon and 1:00 pm on Sunday, July 22, 2018. The Bottleneck is a narrow couloir, just 400m/1,300-feet below the summit and directly underneath the giant hanging serac. It is estimated at 50 to 60 degree steepness. Today, many teams bypass the couloir altogether by climbing a rock buttress to the climber’s right on ascending. The Japanese team was closed followed this year. Led by Japanese mountaineer Akira Oyabe, they had been preparing for two years. They arrived at the end of May in Pakistan to get a jump of other teams and hopefully have the time to wait out poor weather. This was Oyabe’s third attempt after being stopped by high winds in 2009, and heavy snowfall in 2013. They were alone on K2 in early July and fixed the route to Camp 2 but then heavy snows hit cancelling all their work. They had no Sherpa support but two Pakistani High-Alttiude Porters on their summit push. Heading to narita. In the afternoon flight to Pakistan. I’m going to take a few months off, and I’ll challenge you to the summit of 8611 M. For the last two weeks, I am truly grateful to have a send-off party of various kinds of tastes like every day. I had to save a lot of drinking while I wasn’t on the expedition lol. Please forgive me for not being able to thank you all by yourself. I hope you’ll have a good time and return home safely and thank you again for your report. Since there is no communication environment during the expedition, it will be difficult to make information, but the progress of the climbing team is sometimes up to the official fb page of the Northern Japan climbing study group. If you’d like, I’d be happy if you’d like to see your page. Okay, I’ll go. My condolences to Mr. Wantanabe’s family, teammates and friends. > Today, many teams bypass the couloir altogether by climbing a rock buttress to the climber’s right on ascending. Are there any pictures of this section that we (the readers) could see? I found a number of wonderful images and videos on Alan’s coverage of his 2014 trek. You should read the last entry about the descent. It’s very moving. Sad to hear this. I read your account of the descent of K2 which described how dangerous it is and how easy to die.